Some rooms at Jurys Inn should be available for check in after 1.00 pm on Thursday. If the room is not available and you have a tour to go on you may wish to go to the hotel and leave luggage there until your rooms are ready. Study Tours all depart and return from Jurys Inn main entrance at different time. Please allow plenty of time between arrival and the start of your tour. 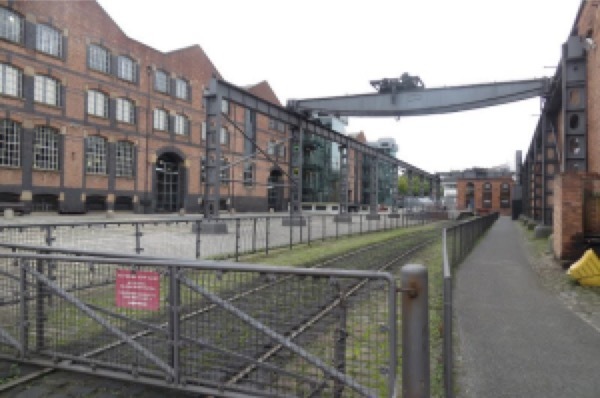 This tour will explain the history and archaeology of Castlefield which was the scene of Manchester’s birthplace and world important transport innovation. It will showcase the remarkable, nationally significant, transport heritage and examine the impact, tensions and opportunities of new infrastructure and apartment developments within this unique environment. Norman Redhead is the Director of the Greater Manchester Archaeology Advisory Service at the Centre for Applied Archaeology, University of Salford. 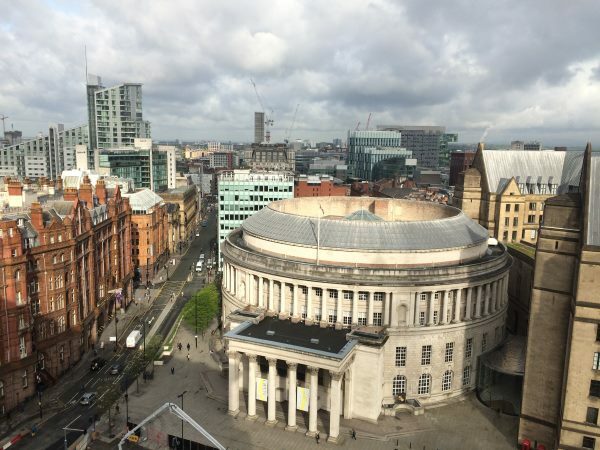 He has over 30 years’ experience of advising on and curating Greater Manchester’s archaeology on behalf of the ten Greater Manchester authorities including Manchester City Council. William Green's late 18th century plan of Manchester and Salford captured the Industrial Revolution related outward expansion of Manchester town when it was well underway but was only just beginning to encroach on the fields to the north of the area now covered by the City Centre's Whitworth Street Conservation Area. Green's plan also foresaw the sweeping tide of new development that would soon engulf this largely rural landscape by indicating the intended route of the Rochdale Canal and an overlaid outline of a proposed grid-street pattern. By the 1850's the area had been traversed by the canal and part of today's West Coast railway line with stations bookending the area to the east and west. New buildings infilled much of the street grid and some sites were already being developed for a second time for some of the warehouses that still define the character of much of the area. This tour will use the transport related infrastructure as the focus for an informed stroll through this evolving historic environment. It will take in what today is seen principally as a Victorian and Edwardian cityscape (but with its somewhat overlooked Georgian origins) which has been shaped by more recent regeneration and continues to experience on-going pressure for change. John Whyard has a degree in Town and Country Planning, an MA in Urban Design and is a member of the RTPI, IHBC and Urban Design Group. He has worked with Manchester City Council’s Planning Service for over twenty years and has been one of the Council’s Urban Design and Conservation Officers since 2010. In a varied career with Manchester City Council, mostly focusing on the City Centre, he has held roles in teams specifically dealing with development management, planning policy, regeneration, environmental improvement and corporate initiatives. John has previously held conservation officer posts at Durham City Council and Lincoln City Council, has worked as the planning agent with both the Central Manchester and Trafford Park Development Corporations (with primary responsibility for their day-to-day planning application work) and for Trafford Metropolitan Borough Council as a development management officer. 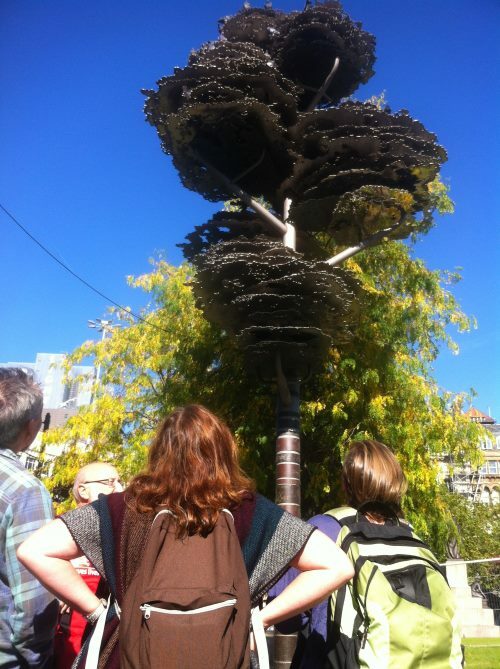 The guided walk round the Manchester Peace Trail (www.discoverpeace.eu) covers sites connected with the growth of Manchester as the world’s first industrial city and its importance as a centre for peace and radical political activity. Themes and sites include Peterloo, the campaign against slavery, religious toleration, migration, gay rights and the Nobel Peace Prize. Steve Roman is an active campaigner and helped the city council to develop the Manchester Peace Trail (www.discoverpeace.eu) around which he regularly leads guided walks. He is also Membership Trustee of the Victorian Society and for 8 years he toured the Society’s photographic exhibition Saving a Century, curated by noted architectural historian Gavin Stamp, to 70 venues around the country. Prior to retiring, he served as a youth and community officer for Lancashire County Council. The origins of Manchester lie in its strategic location at the convergence of the rivers Irwell and Medlock. Here the Roman fort of Mamucium was established in about 79 AD at the junction of several Roman cross-country routes. Subsequently the success of Manchester as both a commercial and a manufacturing centre depended on this strategic location and on the development of an ambitious transport infrastructure. The layout of the city centre is approximately triangular, with important transportation hubs at each point of the triangle. By far the most interesting of these is around Castlefield. Plans to make the Mersey and Irwell navigable as far as Manchester were put forward in 1712 and the navigation was completed in 1736. Quays and warehouses lined the Castlefield river frontage. James Brindley’s Bridgewater Canal was the first modern canal in Britain; its Castlefield terminus was completed in 1765 with the construction of large wharves and the first canal warehouse. 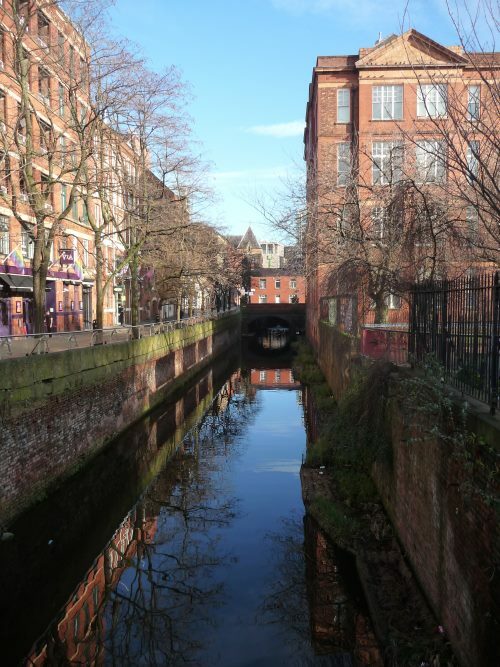 The Rochdale Canal was begun in 1791 and joined the Bridgewater Canal in Castlefield in 1806. 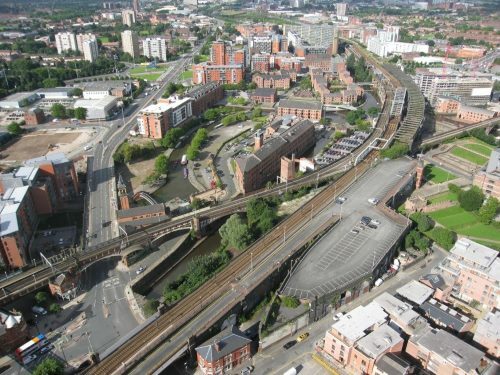 In 1830 one of the world’s first public railway linked Manchester and Liverpool; its Manchester terminus survives on the eastern bank of the River Irwell. In 1839 the Salford Junction Canal crossed the city underground to link the Mersey and Irwell Navigation with the Rochdale canal. Major railway viaducts crossed Castlefield in 1849, 1877 and 1893, demolishing the Roman fort in the process. One of these viaducts now carries the Manchester Metro tram system. The construction of the Manchester Ship Canal between 1887 and 1893 enabled Manchester to become the third busiest seaport in England. This spurred further development in Castlefield with the construction of the enormous Great Northern Warehouse of 1898. 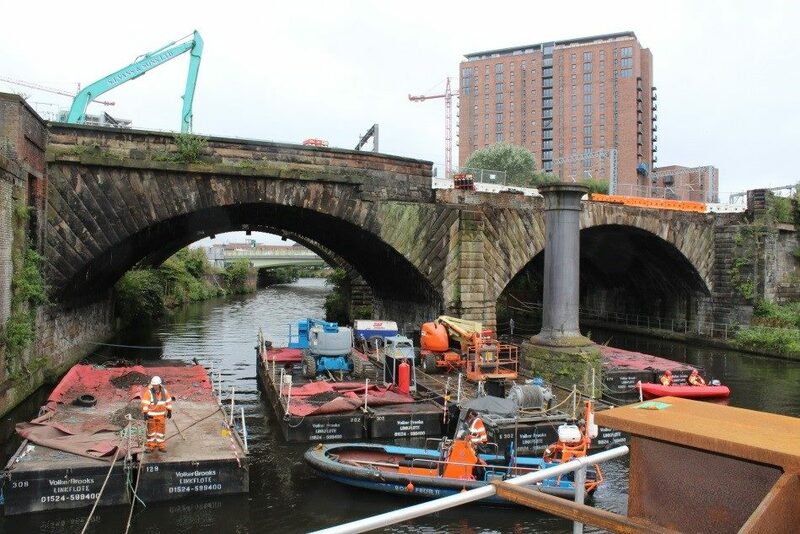 In 2016 work began on the Ordsall Chord, which crosses most of the sites described above to link major cross-country rail routes. This tour will include most of these surviving sites. Ken Moth is a retired accredited conservation architect and deputy chair of the Victorian Society. Dr Julian Holder is Lecturer in the History and Theory of Architecture in the School of the Built Environment at the University of Salford. Attached to its Centre for Applied Archaeology he was previously Inspector of Historic Areas and Places with English Heritage in the North-West and also worked as a Listing Inspector in Designation. He has enjoyed a long career in both academia and conservation and has written widely on conservation and architectural history. He is author of the recently published ‘Neo-Georgian architecture 1880-1970: a reappraisal’. Manchester city centre is booming with infrastructure investment on a scale not seen since Victorian times. This includes major improvements to Piccadilly, Oxford Road and Victoria Stations, a new urban railway between Manchester and Salford and a second tramway through the heart of the city centre. There’s also investment in a new cultural venue, The Factory, and in our streets and public spaces. Investments that are helping to regenerate and enhance Manchester City Centre. Laurie’s tour aims to help IHBC members make sense of the main new infrastructure projects in the city centre. And we’ll look at some of the heritage issues and challenges that we’ve faced in taking these projects forward from design to delivery on the ground. Laurie Mentiplay is a Chartered Town Planner, Urban Designer and Associate Director with global infrastructure consultants WSP. Since 2014, he’s been seconded to Manchester City Council’s Planning team where he is playing a leading role in delivering projects in the city centre. 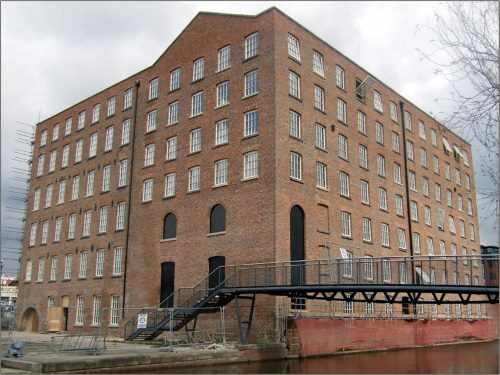 This tour will follow the line of the Rochdale Canal to Piccadilly and the Rochdale and Ashton Canal basins, finishing at the Ancoats textile mills. Along the way we will be discussing the impact on archaeology and the built heritage of Manchester’s redevelopment since the mid-1990s. This will include warehouse conversions, the impact of the Manchester tram network and the redevelopment of the Ancoats industrial suburb. Dr Michael Nevell is Head of Archaeology at the Centre for Applied Archaeology, University of Salford. He is editor of the international journal 'Industrial Archaeology Review', co-author of the Council for British Archaeology’s Handbook of Industrial Archaeology, published in 2012, and Vice-Chair of the Association for Industrial Archaeology. He is the current Chair of the CIfA Buildings Archaeology Group. His research areas include the archaeology of the textile industry, workers’ housing, buildings archaeology, industrial landscapes, and archaeological theory relating to industrialisation. He is the author of many books and articles on industrial archaeology and buildings, including recent studies of the Bridgewater Canal, railway warehouses, and the archaeology of Glasgow and Manchester. 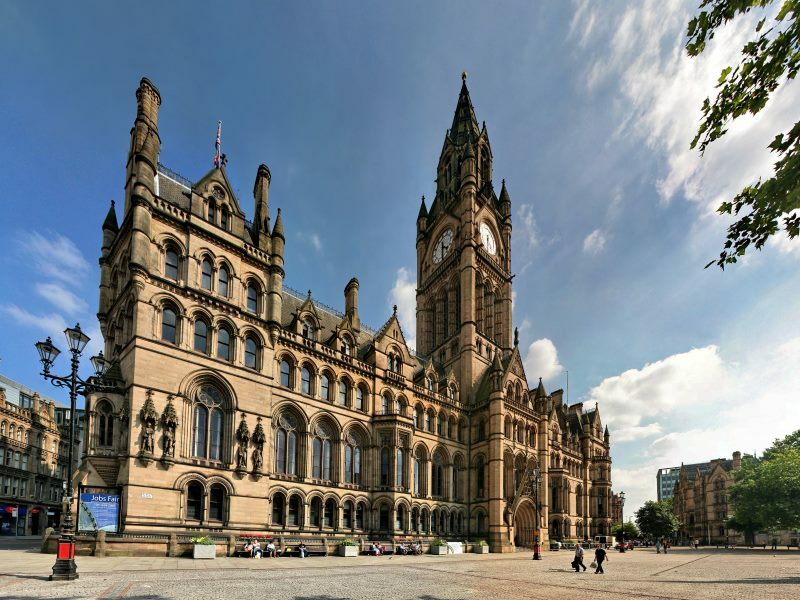 Manchester Town Hall is a Grade I listed building of international significance which is highly regarded for its exceptional architectural quality. Located in the heart of Manchester, it is the focus for the civic complex which includes the Town Hall extension and Central Library. The buildings are framed by two of Manchester’s most significant public spaces; Albert Square and St Peter’s Square. For 140 years the building has been central to the governance of Manchester, and is now a valued heritage asset with significant levels of ceremonial, municipal and commercial uses. Designed by Alfred Waterhouse, the building opened in 1877. It contains many grand ceremonial rooms, such as the Great Hall, which is decorated with murals by Ford Madox Brown that illustrate the history of the city. In 1938, a detached Town Hall Extension was completed and is connected by two covered bridges over Lloyd Street. The Town Hall, which was listed Grade I in February 1952, is regarded as one of the finest interpretations of Gothic revival architecture in the world. The building faces Albert Square to the north, featuring the Albert Memorial (Grade I listed) and St Peter’s Square to the south, home to The Cenotaph (Grade II* listed, Edwin Lutyens). 11:35 am Upgrading the UK’s historic railway infrastructure: is there a fundamental incompatibility between a modern railway and its heritage? Mark Clifford is the Building Conservation Manager at the Museum of Science and Industry where he is responsible for the conservation, maintenance and capital works that affect the historic estate. He previously worked as a Heritage Adviser for the Canal and River Trust before joining the Museum for the newly created position in 2016. 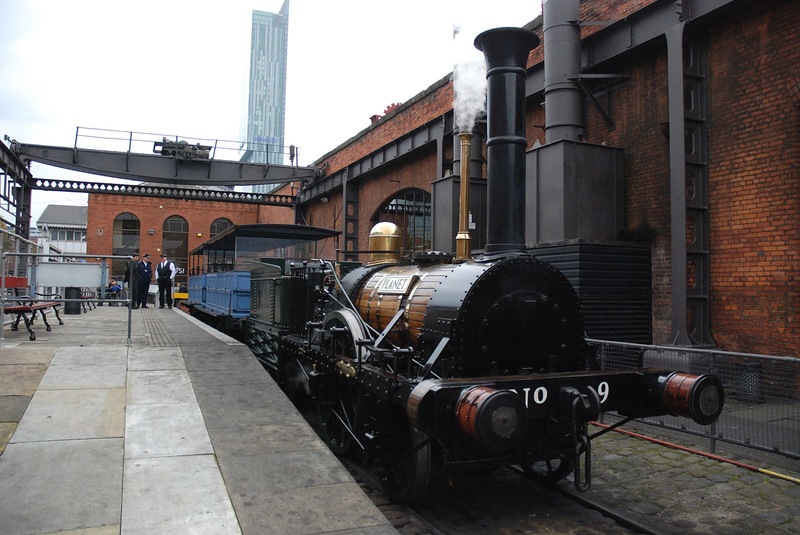 The tour will explore the estate of Grade I and Grade II listed buildings comprising the world’s oldest railway warehouse and the world’s oldest surviving passenger railway station and explore some of the conservation challenges MOSI faces. The Museum of Science and Industry (MOSI) is a large museum devoted to the development of science, technology and industry with emphasis on the city's achievements in these fields. It is situated on the site of the world’s first inter-city passenger railway station (grade I listed) which opened as part of the Liverpool and Manchester Railway in September 1830, designed by the noted engineer George Stephenson. Surrounding the station is a number of warehouses and structures which were constructed to support the continued railway use of the site. This includes the grade I listed 1830 Warehouse, an exceptional and first example of the railway warehouse building typology, with no known predecessors. In 1978, the Greater Manchester Council purchased the earliest part of the former Liverpool Road Station from British Rail. By this time the buildings were in a dire state of repair, having been left empty for a number of years and being used as general goods and storage for most of the 20th century. The museum opened on this site on 15 September 1983 and later expanded to include the whole of the site. The Museum of Science and Industry illustrates Manchester’s phenomenal success as being one of the first global, industrial cities, and it’s incredible rise, decline and rebirth. This story is told through many collections and displays from textiles to computers; the objects and documents held in the museum’s collection tell stories of everyday life over the last 200 years including the history of the station site itself. 9.00 am - 10.00 am Study tours depart from Jury Inn. Lunch will be provided for those on the full day tours (Liverpool, Anderton Boat Lift and Blackpool-Preston). Bags can be left at the Jury Inn for later collection and can also be taken on coach tours. Please note this tour involves a notable amount of walking so please bring sturdy shoes and wet weather gear. Peter Jenkins and Bernadette Bone will lead a walking tour on recent and current rail infrastructure works in Manchester. 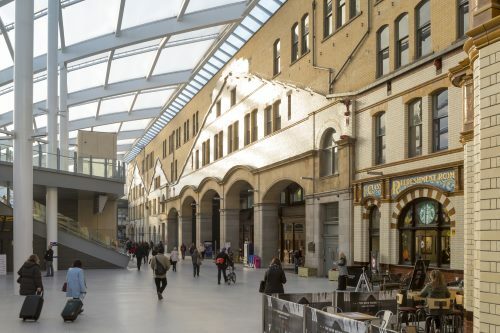 The tour will start at Victoria Station and will focus on the redevelopment and refurbishment of the station describing the overall project requirements and how they have been delivered through new construction and repair of historic fabric. The group will then take a short train journey from Victoria to Salford Central to continue the tour around the site area of the Ordsall Chord. This will be a tour of the construction works in progress which include major new infrastructure alongside significant fabric repairs to the listed railway structures. Bernadette Bone is a qualified architect with over 15 years’ experience of designing in historic environments. Bernadette is an RIBA Accredited Conservation Architect (RIBA CA) and has a Post Graduate Diploma in Building Conservation (PostGradDipl AA). She sits on Manchester’s Historic Buildings and Conservation Areas Panel. Pete Jenkins is a widely experienced and highly regarded architect director specialising in rail related transportation work including acting as lead architect on major, completed rail station projects of national significance. He has over 15 years’ experience as a Chartered Architect and has experience of all aspects of rail project delivery including masterplanning, management of multidisciplinary design teams, client liaison, stakeholder consultation and planning and listed building approvals. Pete is a regular speaker at transportation sector events including the 2007 (Amsterdam), 2008 (London), 2011 (Copenhagen) & 2012 (Vienna) Passenger Transport Expo’s, plus a number of academic institutions including the Universities of Manchester and Liverpool. He has also presented at the 2011 Kuwait Rail Conference and was a keynote speaker at the PED2012 conference in Zurich. His work has been published in magazines and books including ‘Stations’ by Chris van Uffelen (2009) and ‘Interchanges’ by Professor Brian Edwards (2011). Leads: John Hinchliffe of Hinchliffe Heritage (former Liverpool World Heritage Site Officer) and Graham Arnold (former Conservation Officer for Wirral and Sefton). The huge scale and importance of Liverpool’s historic docks made it the Second City of the British Empire in the late 19th C (according to Benjamin Disraeli!) and they still embody the outstanding universal value which justified Liverpool’s inscription on to UNESCO’s World Heritage list in 2004, as the supreme example of a commercial port. The operational needs of the port stimulated a continual process of improvement in port facilities and the supporting transport infrastructure which was necessary to carry goods and people over-land, on canals, railways and roads and through tunnels. The spirit of innovation, driven by commercial need, spread throughout the city and resulted in a book-full of national and global “firsts” and superlatives, including the construction of one of the first domestic airports in 1930 and even the invention of football goal-nets by the City Engineer, J. A. Brodie, in 1889! The tour will briefly: visit the old airport (now a hotel) and its hangars (now a sports club); pay homage to Brodie Avenue (named after the engineer) and the new transport inter-change at South Parkway; follow the the full length of the city’s docks, from Herculaneum Dock in the S to the newly-opened £400m L2 deep-water container terminal in the N, taking in Albert Dock, the new canal link at the Pier Head and Old Dock (the world’s first commercial enclosed wet dock). A stop will be made at Stanley Dock (winner of the 2015 NW IHBC Conservation Award) where work is proceeding on the conversion of the Tobacco Warehouse - the largest brick warehouse in the world. From there can be seen the site of the approved Liverpool Waters development, which has resulted in UNESCO placing Liverpool on to the list of World Heritage In Danger. The tour will return to the City Centre with a look at: a stretch of the Leeds and Liverpool Canal; the Queensway Tunnel, the world’s longest under-water road tunnel (when built) and; the dis-functional elevated walkways and roads of the mid-20th C. Those wishing to return home from Liverpool’s Lime Street Station will be dropped off there and those wishing to return to Manchester will be taken back, via a quick look at Edge Hill Station (the world’s oldest operational station) and the (outrageously unlisted) Wapping Tunnel of 1830, which linked the Liverpool and Manchester Railway to the docks from the beginning. John Hinchliffe has lived in and around Liverpool since 1980. John worked for Liverpool City Council from 2001 until 2012 as the World Heritage Officer and co-ordinated Liverpool’s successful nomination as a World Heritage Site. 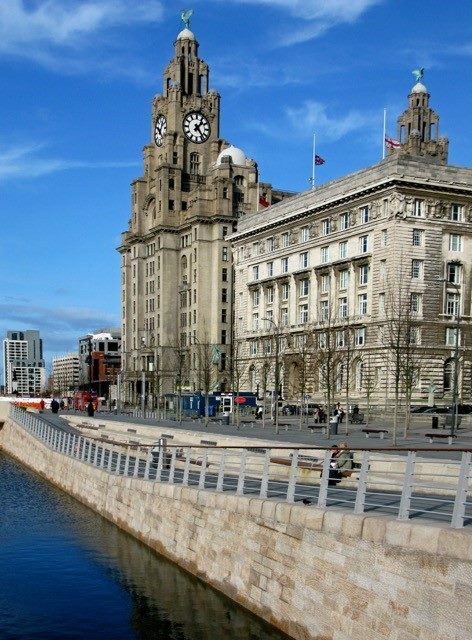 In so doing, he ensured that the outstanding universal value of Liverpool’s historic docks, including Albert Dock and Stanley Dock, were internationally recognised. He then provided heritage advice on major developments affecting the WHS: Liverpool 1, the Museum of Liverpool, the Mann Island Development; the Liverpool Canal Link; Liverpool Waters and; the conversion of the warehouses at Stanley Dock to mixed uses. As a member of the RTPI and the IHBC, he aims for the highest standards of building conservation but also encourages contemporary development which expresses the spirit of the day, whilst respecting its historic context. Since 2012, John has been an independent heritage consultant, providing heritage advice on a diverse range of heritage-based projects across the country including: the implementation of the restoration project at Stanley Dock, Liverpool; the creation of the British Music Experience in the Cunard Building, Liverpool and; the restoration of the Royal Haslar Hospital, Gosport and its conversion into a retirement village. He was the principal author of Liverpool World Heritage City (2014) and co-author of Old Dock, Liverpool (2015). Graham Arnold, although now retired, has worked in local authorities around Merseyside as a planning officer and conservation officer since the late 1960s. His first experience was in the planning of the inner city areas of South Liverpool including Sefton and Princes Parks. A secondment to the Merseyside Structure Plan Team prior to Local Government reorganisation involved developing policy on environmental matters from pollution to urban form and structure. This was followed by acting as a liaison officer with St Helens and Knowsley on local planning and development control including the development of the main Pilkington UK5 factory. After a year studying at York for a masters in Conservation Studies he became the conservation officer for West Lancashire carrying out a design for the pedestrianisation of Ormskirk Town Centre. A time at Sefton as conservation officer included the improvement of Lord Street in Southport, restoration of the Pier and repair of the Garden Temple at Ince Blundell. He finished at Wirral as conservation officer involved with the management of Port Sunlight, repair of Hamilton Square and the restoration of the Grade 1 Birkenhead Park. Canals have played a significant historic part in the UK’s transport network and hence the country’s economic growth during the industrial revolution. Despite a period of partial decline, in the 20th century, the canal system is again seeing increasing use. The tour will explore an example of the links between historic canals and industrial heritage in Northwich, Cheshire, a town that has made its living from salt for 2000 years, and will include two successfully restored heritage sites in the area; the Anderton Boat Lift and the Lion Salt Works, both of which have won prizes. 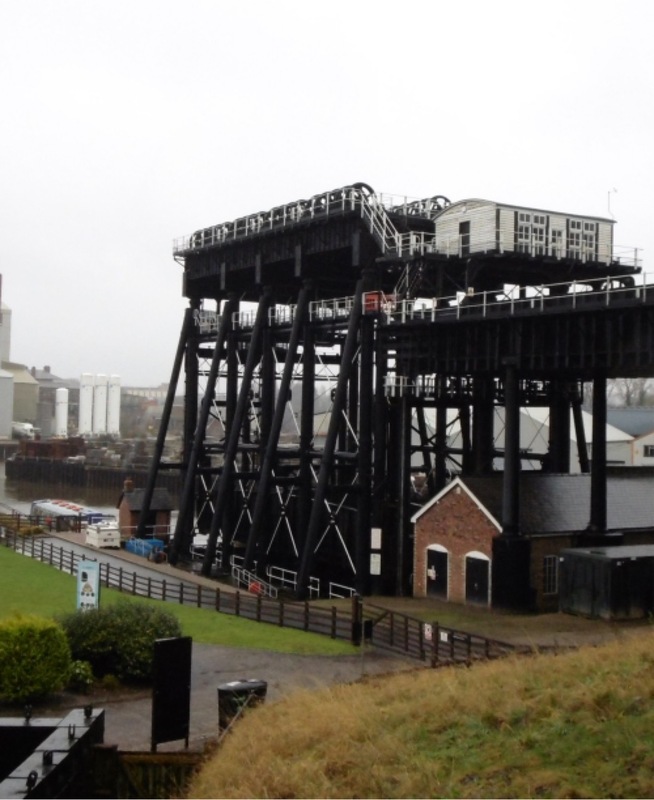 In the morning, we will visit the Anderton Boat Lift, a masterpiece of the ingenuity of Victorian engineers to overcome boat transport obstacles and improve navigable routes for transporting salt. It is a massive iron framework that links vertically two navigable waterways, River Weaver and Trent and the Mersey canal. We will experience the boat lift and then cruise on the river to view the industrial heritage of Northwich. Anderton Boat Lift is the oldest boat lift still intact and following its restoration a decade ago, and was awarded a Heritage Engineering award in 2014. In the afternoon, after a short 10 minute coach ride, the tour will continue to explore the site and recently restored buildings of the Lion Salt Works, one of the last remaining open pan saltworks in the country, one of only three of its kind in the whole of Europe. The site was converted into a unique visitors centre and museum by Donald Insall Associates and the tour will be led by Mr Simon Malam, the architect in charge of the team responsible for the restoration and implementation of this prize winning project. 11:30 am Tour starts with the lift and then the trip will follow at 12 noon. 12:30 pm Transfer to Lion Salt Works by coach. 3:45 pm Depart arriving in Manchester at approx 4.30 pm (depending on traffic - 35min trip on coach). Dr Maria Yioutani-Iacovides is a Conservation Architect with a professional experience in Cyprus and the UK on the Conservation, repair, and restoration of secular, ecclesiastical, residential historic and listed buildings. She has also worked as the Conservation Officer for the Methodist Church, which she describes as a challenging and wonderful experience on the conservation of listed chapels, urban and rural, dating from the 18th century onwards. Maria has a strong interest in vernacular buildings and settlements, in particular, those that are abandoned and have potential to be sustainably developed. In addition, she is also interested in architectural history and therefore for her PhD thesis she studied the interactive architectural influences between Medieval and Byzantine Church Architecture in 12th to 16th centuries, in Cyprus. Simon Malam is a Practice Director at Donald Insall Associates, an AABC registered architect and member of the IHBC. He is on the management team of the AABC and currently co-chair. Over the last 17 years he has worked as a conservation architect on the repair, alteration and adaptation of some of the country’s most important historic buildings. His specialisms include timber-framed structures and places of worship, and he is incumbent architect at Bangor Cathedral. Whilst the birth of the motor car dates to 1886, it did not gather serious momentum until after World War II. Post-war reconstruction and decentralisation in Great Britain in the 1950s increased the need for new fast freight and passenger links, with motor transport being the most favoured. In order to accommodate the growing capacity of motor cars, an arterial network of motorways began to be developed. The first motorway to be built in Britain was the 8 mile Preston By-pass (now forming part of the M6) was opened in December 1958. During this time, new building typologies dependent on the motorway began to be developed, including the service station and multi-storey car park. Service stations were necessary for the rest and refuelling of both vehicles and passengers, but their comprehensively planned facilities were also a direct expression of the perceived significance of motorways. One of the most striking of these services stations was Forton Services and its unique landmark 22m high tower with cantilevered restaurant and sun deck. It was constructed in 1965 at the peak of motorway service stations and was designed by the noted London-based architects' practice T P Bennett & Sons. The building, notably the tower, is reminiscent in form to an airport control tower, evoking the modern glamour of 1960’s air travel. When first built, the spectacle of modernity and twenty four hour opening imbued a glamour which not only attracted locals but a national audience. Following the construction of By-Pass, Preston set itself as a major network hub, being in the forefront of developments in road transport. As part of this, the Building Design Partnership was commissioned to design and build a new bus station, car park and taxi rank. 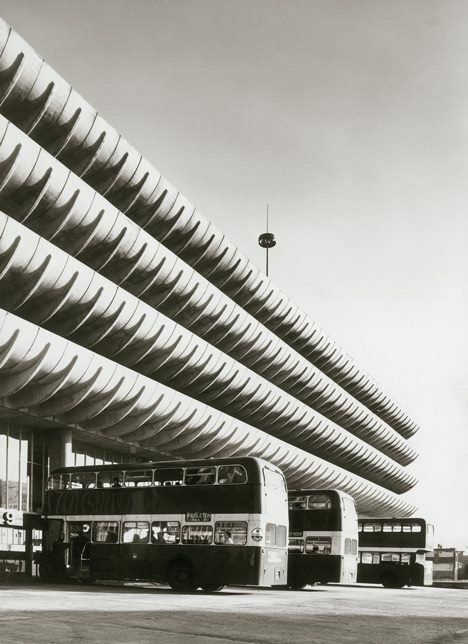 The Brutalist designed Preston Bus Station and Car Park subsequently opened in October 1969 and was, at that time, Europe’s largest bus station. Similar to Forton, the ambitious scale and high design standards of the bus station resulted in a structure more reminiscent of a post-war airport terminal than a mere bus station and car park. Jack Haw has a diverse background within the historic environment, initially working in the voluntary sector, local authority and now private consultancy where he is a Senior Heritage Planner at Turley. He is a chartered member of the Royal Town Planning Institute and a full member of the Institute of Historic Building Conservation. Jack is passionate about the historic environment and recognises the need to manage and promote change within the historic environment. He has a thorough knowledge of the historic environment and the planning and legislative framework within which it sits, both across England and Scotland. Whilst having a wider knowledge of architectural history, he has specifically developed a strong understanding of post-war architecture in England. Kirsten McKnight has over 10 years’ experience working in the heritage sector and currently works as a private heritage consultant. Working for a wide range of public and private clients, Kirsten has been exposed to buildings and sites of all types, ages and issues. Whilst she cut her heritage teeth working for the Georgian Group in London, varied roles working for the RIBA, the Globe Theatre, Mouchel and Heritage Architecture have furnished Kirsten with an excellent working knowledge of the legislative framework related to the historic environment, which is supported by an extensive knowledge of British architectural history and conservation philosophy. Manchester is a city which developed along its rivers and waterways. Our walk will explore the origins of the city and how canals played a major part in the expansion of the city. We will set off from Jurys Inn along the Rochdale canal to see the early commercial and industrial development which sprang up alongside the canal and in Piccadilly basin, We will end our walk exploring Ancoats reputedly the ‘world’s first industrial suburb’. Simon Green is an architect working in the city, with an interest in architectural heritage. He was President of the Manchester Society of Architects in 2008-2010 and is an active member of the architectural community in North West. Simon is a member of the Twentieth Century Society and has led several walks for the Civic Trust and visiting architects to Manchester. In 2015 Simon curated the 150 year anniversary exhibition of Manchester Architects in collaboration with Manchester Metropolitan University Special collections. Titled ‘We built this city’ the exhibition explored Manchester’s rich architectural heritage and included original works by Alfred Waterhouse, Thomas Worthington and Edgar Wood among others. Simon is keen to share his enthusiasm of Manchester’s architecture during this walk.